Entering text on mobile devices is still considered inconvenient by many; touchscreen keyboards, although much improved over the years, require a lot of attention to hit the right buttons. Voice input is an option, but there are situations where it is not feasible, such as in a noisy environment or during a meeting. Using handwriting as an input method can allow for natural and intuitive input method for text entry which complements typing and speech input methods. However, until recently there have been many languages where enabling this functionality presented significant challenges. Today we launched Google Handwriting Input, which lets users handwrite text on their Android mobile device as an additional input method for any Android app. Google Handwriting Input supports 82 languages in 20 distinct scripts, and works with both printed and cursive writing input with or without a stylus. Beyond text input, it also provides a fun way to enter hundreds of emojis by drawing them (simply press and hold the ‘enter’ button to switch modes). Google Handwriting Input works with or without an Internet connection. By building on large-scale language modeling, robust multi-language OCR, and incorporating large-scale neural-networks and approximate nearest neighbor search for character classification, Google Handwriting Input supports languages that can be challenging to type on a virtual keyboard. For example, keyboards for ideographic languages (such as Chinese) are often based on a particular dialect of the language, but if a user does not know that dialect, they may be hard to use. Additionally, keyboards for complex script languages (like many South Asian languages) are less standardized and may be unfamiliar. Even for languages where virtual keyboards are more widely used (like English or Spanish), some users find that handwriting is more intuitive, faster, and generally more comfortable. Writing 'Hello' in Chinese, German, and Tamil. Google Handwriting Input is the result of many years of research at Google. Initially, cloud based handwriting recognition supported the Translate Apps on Android and iOS, Mobile Search, and Google Input Tools (in Chrome, ChromeOS, Gmail and Docs, translate.google.com, and the Docs symbol picker). However, other products required recognizers to run directly on an Android device without an Internet connection. So we worked to make recognition models smaller and faster for use in Android handwriting input methods for Simplified and Traditional Chinese, Cantonese, and Hindi, as well as multi-language support in Gesture Search. Google Handwriting Input combines these efforts, allowing recognition both on-device and in the cloud (by tapping on the cloud icon) in any Android app. 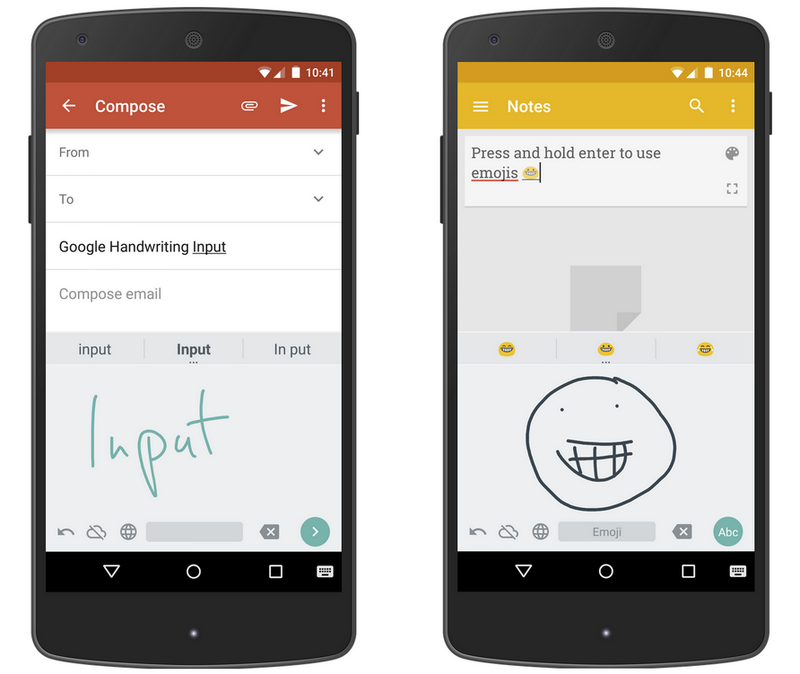 You can install Google Handwriting Input from the Play Store here. More information and FAQs can be found here.